Declaring 2014 a “year of action” as he unveiled a series of relatively meager executive actions, President Barack Obama vowed in his State of the Union address Tuesday night to sidestep Congress “whenever and wherever” he can in order to push through his agenda. 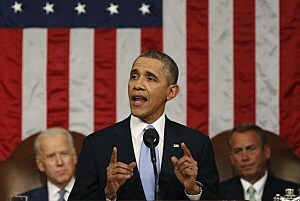 President Barack Obama delivers his State of the Union speech on Capitol Hill in Washington, Jan. 28, 2014. Obama told lawmakers he’s still willing to work with Congress, but will take the necessary steps to reduce the wage gap between rich and poor. Specifically, the president focused on the need to boost middle class while improving economic mobility. “He pressed Congress to revive a stalled immigration overhaul, pass an across-the-board increase in the federal minimum wage and expand access to early childhood education — all ideas that gained little traction after he proposed them last year. The president’s one new legislation proposal calls for expanding an income tax credit for workers without children,” the Associated Press reported. In his hour-long address, Obama vowed to flex his political powers in an effort to Obama promised to flex his power to accomplish tasks that gained little traction after they were initially proposed a year ago. The president said he will continue to push for an across-the-board increase in the federal minimum wage and to revival an immigration overhaul that has been stalled. He also spoke of the need to expand access to early childhood education programs. As for new legislation, the president called for expanding an income tax credit for workers without children. Briefly addressing the situation in the Middle East, Obama pointed out that when he took office, nearly 180,000 Americans were serving in Iraq and Afghanistan. “Today, all our troops are out of Iraq. More than 60,000 of our troops have already come home from Afghanistan. With Afghan forces now in the lead for their own security, our troops have moved to a support role.Together with our allies, we will complete our mission there by the end of this year, and America’s longest war will finally be over,” Obama said. Obama’s speech came as he sought to re-energize his second term as his approval rating dips and the Democratic Party faces the possibility of losing control of the Senate following the next general election in November. The president lost ground with the start of the Affordable Care Act and subsequent issues with the program’s website. This term will give Obama his best chance to push through his agenda.